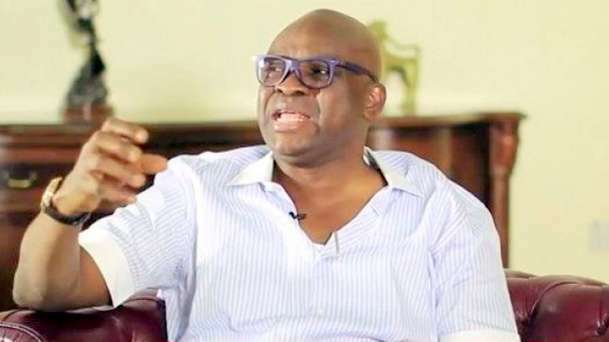 The governor of Ekiti state, Mr Ayodele Fayose, Saturday insisted that his candidate, Prof. Kolapo Olusola of Peoples Democratic Party, PDP, must win the ongoing election in the state. Speaking to journalist immediately he cast his vote, Fayose said that he is in charge of Ekiti with about 80% and by the grace of God his candidate will come out victorious after the election. His words, “This process, INEC might mean well, but the process has been hijacked by security agencies. It is a national disgrace for the security agencies. National disaster and there is danger ahead,” he said. “Remember we raised all these issues. As I speak to you, they said they deployed 30, 000 policemen, military, paramilitary and all that but thugs are snatching ballot boxes everywhere. And what they call see and buy politics is thriving everywhere with the police and civil defense giving signs to people bearing the money so that they can pay the voters. “It is my duty to vote and be responsible in voting, and that’s why I have stayed in my house and I’m going back now. “But no matter what it is, I’m winning this election. There’s a difference between what I’m narrating and my capacity to win. On top of all these things they are doing, I will still win this election, because this state I’m in charge by 80% by the grace of God. I won the last election by 82, 000 votes, how do they recover from that 82, 000 even if they cut the heads of 82, 000 people, they can’t get far. “I raised all these alarms that this elections may be marred with violence, and that’s exactly what’s going on now. In almost all local government, PDP chieftains are being arrested. Council chairmen, house of assemblies members, majority of my people are being arrested. My chief of staff is in detention. He was arrested about an hour ago,” he said. “Card readers were not working in more than 50% of the places. In Efon-Alaaye, most card readers weren’t working. We have some units where they only accredited only 20 people. Where one voter spends up to about 40 minutes. Some didn’t have their fingers go through. I think INEC needs to be enhanced,” he said.